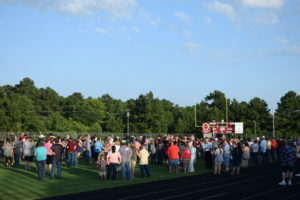 GRAPELAND – The Grapeland community came together on Sunday evening to say goodbye to both a teacher and a student who were taken way too soon. Perry Frank, 61, lost his life unexpectedly after complications developed from a medical procedure while 16-year-old Gus Kennon perished in a traffic incident. Frank was the longtime GISD band director and Kennon had just completed his freshman year at GHS and was active in the Sandie Band. 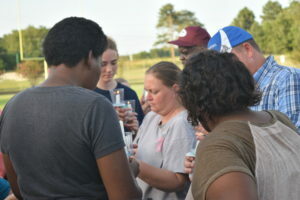 Both were remembered on July 2 as approximately 300 community members gathered at Sandie Stadium to honor their memories. 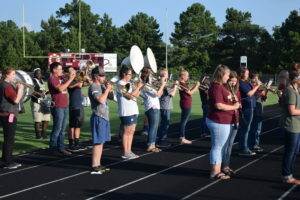 The band, which both Frank and Kennon dearly loved, opened the ceremony with “Hail to the Sandies,” followed by the school fight song and then a selection of music Frank had the band perform during last year’s football season. egan to fade into the warm, evening air, GISD Superintendent Don Jackson welcomed those in attendance. GHS senior D’Angelo Colter spoke for the band and said he learned from the band director. “Even during the worst of times, he would always have a smile on his face. I can truly speak for the band when I say we will always miss him and Gus. They were dedicated band members and from our hearts, we will always have them in our memories,” he said. GHS band member Macy Cutler said Frank was always encouraging his students. “He was a great man,” she said. Colter added Kennon always had a smile on his face. “He was a true person who always had a very positive attitude. Gus was one person I could always count on. He was one of my friends. He inspired me to be a better person and was truly a leader in my eyes,” he said. Tabitha Richie, president of the band booster club, said a “go-fund-me” account had been set up to help cover the final expenses of Kennon – and along with a car wash put together by GHS football players – those expenses had been covered. “Gus was a very special young man. I saw him at Mr. Frank’s funeral and he was wearing a suit to honor Mr. Frank. I know that he would have been very honored,” she said. As maroon and white balloons were passed out, Kennon’s father, Josh Kennon, spoke to the crowd in the stands. “There are no words. There are no words to express how much I respect, thank and love every one of y’all. He was always happy and always smiling, even if I had to chew him out. He loved the band and he loved Mr. Frank. Thank y’all so much and God bless you,” he said. 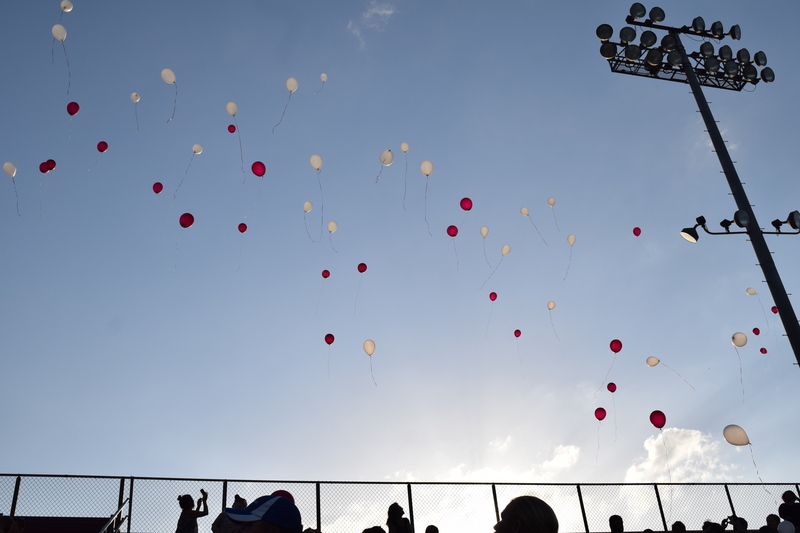 Following the older Kennon’s words, several area pastors offered words of comfort to the crowd as the balloons were released and filled the skies overhead with the memory of Perry Frank and Gus Kennon.